JOURNEY FRONTIERS CASSETTE W/ "SEPARATE WAYS (WORLDS APART)"
JOURNEY! - "SEPARATE WAYS" B/W "FRONTIERS" COL ST 45 VG+ PIC SLEEVE VPI CLEANED! 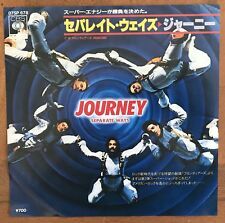 JOURNEY "Separate Ways" PICTURE SLEEVE! BRAND NEW! ONLY NEW COPY ON eBAY!! Classic Rock 45~JOURNEY~Separate Ways (Worlds Apart) / Frontiers~Columbia 7"